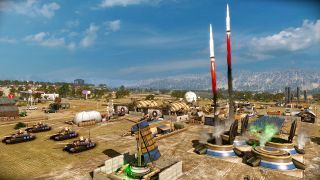 Real-time strategy game Act of Aggression launches today (it'll be available on Steam this evening in the UK), so Focus Home has released one of those launch trailers to try to convince you to pick it up when it does go live. The trailer claims that "the golden age of the RTS is back", so I guess it's for those who don't like the way the RTS genre is going these days. It's a spiritual successor to the ten-year-old Act of War, from the same developer, so if you played that and enjoyed it you might want to check it out. Act of Aggression is set in the near future, with weapons and vehicles to reflect that: see the tanks and planes going kind of invisible in the video. You get to play as one of three global super-powers and fight battles in different environments across the world in a single-player campaign or in online multiplayer. Not sure if it's for you? Don't worry, our review is coming soon.